“Turn back the clock” naturally with Cosmetic Acupuncture! Are you starting to notice fine lines, jowls, or bags under your eyes? Do you want a way to decrease these without having an invasive surgery? Now’s the time to consider cosmetic acupuncture! What is Cosmetic Acupuncture And Can It Help Me? 1. Cosmetic acupuncture is a safer and potentially cheaper alternative to invasive surgery. Are you looking to have soft, smooth, supple skin but don’t really want to go under the knife? Or to foot the bill for that matter! While the pricing *does* vary, the average fees of a medical procedure can cost you anywhere from $6,000 to $15,000. 2. An easier treatment for sensitive skin. 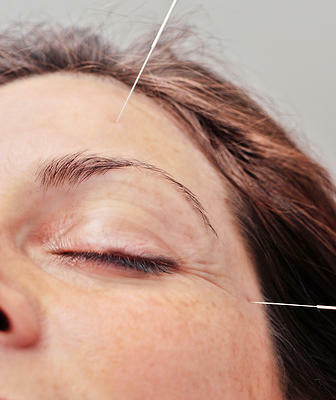 Acupuncture needles are much thinner than regular needles, so there is no tearing of the skin. It’s a simple pin prick and then the act of leaving the needles in to draw bodily fluids and Qi to the proper points. These stimulate the areas and help your body to heal and rejuvenate itself. 3. It is a treatment based off of time-tested TCM (Traditional Chinese Medicine) principles. If you’re looking for something that’s been around for a long time with proven results, acupuncture is about as time-tested as you can get! 4. It is a whole body treatment. Despite the fact cosmetic acupuncture focuses on your face, that doesn’t mean you don’t benefit in other ways. In order for it to work, acupuncturists work on helping the entire body to heal from the inside out. Since this healing method is based on TCM, acupuncture points elsewhere on the body are also selected in order to complete the balancing of energy. Since it can enhance your overall health, it’s like a two for one special!